The Odell Beckham trade changes everything about the Browns offense. I can’t emphasize enough how big of a deal this is. The Browns paid a hefty price for the 26-year-old super star receiver, but Beckham should be the catalyst for this wide receiver group and Baker Mayfield to take them to the next level. 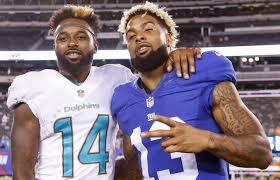 The Giants got a nice return for Beckham (2019 17th overall pick, 3rd round pick, and Jabril Peppers), but it’s a bit confusing considering that the Giants had just locked Beckham in to a long-term deal seven months ago. Not that the Giants plan on competing in 2019, but they are also on the hook for over 16 million dollars of Odell Beckham’s 2019 salary. The Giants will be in full rebuild mode for what most expect to be Eli Manning’s final season with them. I learned a tough lesson last week. Legitimate sources are not right all of the time. So there I was on Thursday night, pounding away at my keyboard about my thoughts on Antonio Brown becoming a Buffalo Bill. I was looking up stats and really trying to imagine what a Josh Allen to Antonio Brown connection would look like. I sent it off to my boys in the group chat and they liked my input. I was happy. The five hours left of sleep that I had before work the next morning was totally worth it. That was until I closed my eyes and tried to get to sleep. What if he doesn’t show up? Why would he want to? Why would 31-year-old and set-for-life Antonio Brown want to play for the Buffalo Bills? He had already went on Instagram and said the trade was fake news, but I chose to ignore the life that this trade was actually affecting. I decided to believe Ian Rappaport and other people who were choosing to believe him as well. Ian’s problem? Not sure. He doesn’t seem like the guy who would put his reputation on the line just to beat Schefter by a couple of minutes. Or would he? Who knows. Today was legal tampering day and we have a bunch of contracts agreed to in principle. Not your school princiPAL. See, I still remember elementary spelling. I believe in second chances for human beings. We are all far from perfect. But, some things are worse than others. I definitely believe if Kareem Hunt was able to handle his punishment with grace and become a spokesman against violence towards women, he would earn his second chance. It is now 9 days after the Superbowl and Kareem Hunt got a job yesterday. There hasn’t been any discipline handed down by the NFL. In fact, the events of the past year are still under investigation by Roger Goodell and his jabronis. I understand that players can still find jobs when they are under the commissioner’s exempt list, but for Kareem Hunt to be signed before free agency has even popped off is a bit off-putting. I’m re-energized and ready to dive into preparation for the 2019 fantasy football season. Most of you are preparing for the fantasy baseball season and to be honest so am I. But, there is room in my heart and my brain for both, thanks to slow drafts. Speaking of slow, how about that Super Bowl, amiright? Maybe we could have used Drew Brees in Atlanta because Jared Goff gave the worst quarterback performance that I can remember in a Super Bowl. Not only was the game a snoozer, but Greg Zuerlein’s missed field goal at the end of the game cost me a $200 dollar square. Oh, gambling. While we’re on the subject, so much for those touchdown props. I’m convinced that we all have secretly died without realizing it and went to hell and our punishment is to witness Boston sports championships for all of eternity. Sports, you are dumb but I can’t quit you! Hey y’all. Please note that where fantasy position ranks are cited: they were pulled from www.pro-football-reference.com’s NFL Fantasy Rankings. Also note that these are non-PPR rankings. This list only includes Un-Restricted Free Agents (UFAs), it does not include Exclusive Rights Free Agents (ERFAs) or Antonio Brown (We can rank Tony once we see if his QB is going to be future HOFer Big Ben or future Gym Teacher Blake Bortles or someone in between, but don’t think either spot or any in between really changes his value much). No, I don’t know what the Broncos cheerleaders have to do with the running backs, but it worked to get your click. Full disclosure, I was totally wrong on the Broncos backfield in 2018, as were many others. At the start of the season, I was expecting a timeshare between Royce Freeman and Devontae Booker with Freeman taking the between the tackles work and Booker being the primary pass catcher. I sit down with Rotowan and Reid and we hash out the gambling prospects of the conference championships. We also talk about the Panther’s fantasy potential if Cam Newton sits out for the 2019 season. We continue our tradition of talking crap about the coaching carousel that happens every season in the NFL, including our disappointment that Hue Jackson doesn’t have a job yet. Come join us!